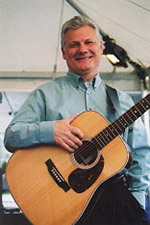 Terry D Lauber, former member of the rock band “Gabriel” and current member of folk group “The Brothers Four” is one of Seattle’s most successful studio musicians and vocalists. He has recorded on over 100 CDs and LPs and has performed on over 3000 recording sessions. As one of the Northwest’s most recognizable commercial vocalists, possibly most notably as the voice on the classic Puyallup Fair jingle “Do the Puyallup,” Terry has been heard on radio and television more than any other vocal talent in Seattle. Recognized for his singing, guitar and pedal steel playing and as a songwriter, Terry has recorded and published many original songs and is currently working on a new original CD slated for release within the next year. Terry has performed and recorded with Ann and Nancy Wilson of Heart, the great Chet Atkins, film composer great Michel LeGrand and many others in his extensive career. And with the Brothers Four, has toured the entire United States as well as numerous tours throughout the world including Japan, Mainland China and Europe.